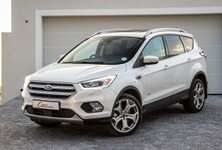 Amid its efforts to rebuild the reputation of the Kuga nameplate in South Africa, Ford launched a thoroughly updated version of its family car late in 2018. 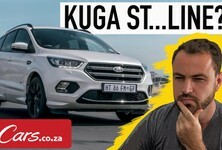 We test a range-topping ST Line derivative, but given the Kuga fire saga that was front page news for weeks in South Africa, it's nigh on impossible to evaluate the product in isolation. The Kuga ST Line does not have many rivals in a segment where diesel is the fuel of choice. While ST versions of the Focus and Fiesta have made Ford's performance badge a household name and inspired legions of fans in the petrolhead community, this is NOT an ST version of the Kuga. 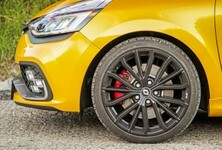 Instead, the ST Line badge denotes aesthetic upgrades only, even if the 2.0T AWD's suspension has received a light ST treatment. The ST-Line spec is designed to appeal to those looking for something that looks like a high-performance vehicle. It's a rather bold move to apply it to a rather large SUV – some may even regard it as counter-intuitive – but it's a tactic the German brands have been using successfully for decades. Audi offers the S-Line trim, Mercedes-Benz the AMG Line, and a number of BMW derivatives bear M badges. Its white exterior finish might lack a bit of imagination, but the 2.0T AWD ST Line looks purposeful. With a well-proportioned design and a poised stance, Ford's (relative) newcomer conveys its intentions well. The aesthetic upgrades strike a good balance between subtle and “look at me”. A bit of suspension work and a body kit gives the ST Line an imposing front end. The list of ST-Line accessories is extensive. Most striking is the all-black grille with revised front bumper, and the all-black 19-inch alloy wheels. "Eighteens" are standard, but the optional 19s fill the wheel arches well and, as we’ll discuss later, seem to make no difference to the ride quality. The suspension is lowered and tweaked for better handling, and the car rides 10-mm lower than a standard car. Other exterior accoutrements include black roof rails, a black rear diffuser (between the revised exhaust ends), darkened headlights and taillights and ST-Line scuff plates in the front doors. To summarise, then, it’s not a shouty car; it just looks well-sorted. As for as the interior, ST-Line detailing adorns the steering wheel, gear boot and the seats in the form of tasteful contrast red stitching. The driver and front passenger are treated to superbly comfortable sport seats, which are trimmed in leather and Alcantara. We covered long distances in the Kuga and the front seats offered great support during journeys thanks to their bucket-like design. They are not difficult to climb into, or out of, at all. Red stitching adds some vibe to the interior, but it feels a little old school in here. One of the highlights of the recent facelift is that Ford has (thankfully) ditched the plethora of buttons that used to plague the Kuga's fascia. What's more, the impressive Sync3 infotainment system sits pride of place in the centre stack, and now features pinch and zoom functionality. Some testers did, however, find the screen a little too far away to be reached comfortably. They found the comprehensive steering wheel controls, combined with the digital display in the instrument binnacle, to be much more convenient for operating most of the system’s functionality. Our biggest gripe with the interior is the fascia's cheap-looking plastics. It feels a bit low rent and lets down what is an otherwise-impressive interior. Size-wise, the Kuga sits roughly in the middle of the family car market, which, given the relative age of Ford's platform (7 years), is quite to be expected. However, it is still large enough to provide generous cabin space for passengers (it can comfortably seat 4 adults, while 3 kids will happily fit side-by-side on the rear bench), plus significant load space for luggage, bicycles and groceries, without feeling cumbersome to manoeuvre. Part leather and part Alcantara seats are very premium. Rear passenger have enough legroom too. For our video reviews, we like to conduct a "cooler-box test" to measure luggage space, using a standard 25-litre cooler box, and the Kuga passed it with flying colours. There is ample height below the parcel shelf and the load bay floor would allow for about 8 cooler boxes packed in 2 rows of 4. An electric tailgate is now standard on all Kuga derivatives and includes a leg-swing opening function, a feature that allows for hands-free operation of the tailgate (even if the car is locked), as long as the key is in your pocket. The function is activated by swinging your foot under the rear of the car to open the tailgate. Some testers found this to be super handy, but it can be a somewhat temperamental feature and didn’t seem to work 100% of the time. Perhaps with some practice, one could develop the perfect leg-swinging technique to "communicate with the car". Meanwhile, a 240-Volt plug port is provided for rear passengers, which our film crew thought was just about the best thing ever invented. A USB port or two in the rear might have been handy too, however. Even though our test unit rode on 19-inch wheels, shod with low-profile performance tyres, the quality of the Kuga's ride was exceptional. Thorough sound insulation certainly helps, and very little road noise makes it through to the cabin. The suspension easily soaks up imperfections in the road and rough surfaces and, on smooth tarmac, the Kuga offers a premium, luxury experience that befits its price point. Boot space on the Kuga is good, but not quite class-leading. The overall composure of the car is impressive. While the suspension has been tweaked to be firmer for better handling, the engineers have achieved an admirable balance between comfort and sharper handling. On the famous Clarence Drive, the coastal road between Gordon’s Bay and Pringle Bay (outside Somerset West) the Kuga proved very fun to drive, while the all-wheel drive and sticky tyres provided near-unflappable traction. In the handling department, the car delivers on the promise of the ST-Line badge. Two engines are available for the ST-Line derivatives. 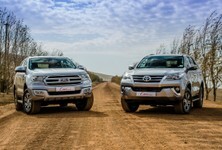 We tested the 2.0-litre, 4-cylinder turbopetrol, while a 2.0-litre, 4-cylinder turbodiesel is also available. With power and torque figures of 177 kW and 340 Nm, the Kuga feels well motivated and eager. It’s not a particularly fast car, but in-gear acceleration is strong and there’s more than enough oomph to ensure the experience is never boring. The peak torque figure is available nice and low down in the rev range (from 2 000 rpm to 4 500 rpm), making it a particularly easy to get the best out of the motor. Even with 19-inch rubber, the Kuga impresses in the ride quality department. The car cruises comfortably on the motorway and the 6-speed transmission ensures the engine speed remains low at highway speeds. However, the average fuel consumption is potentially the Achilles heel of the package. Ford claims an average figure of 8.6 L/100km, but we saw a worst indicated figure of about 12 L/100km. After a 200 km drive on open roads, the readout dropped to 8.7 L/100 km, but neither of those figures is particularly impressive, as the car was never driven with more than 2 adults and light luggage, or 4 adults with no luggage. Perhaps the diesel might be the better option to reduce running costs. With 132 kW and 400 Nm, it won’t be boring to drive, and that extra torque will prove handy when towing or fully loaded. And importantly, on paper at least, fuel consumption is claimed to be 40% better than the petrol motor. 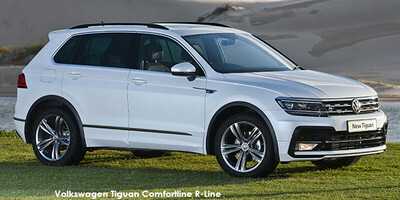 How does it stack up against the Tiguan? While Hyundai mulls over the prospect of offering the facelifted Tucson in Sport guise again (as it did with the pre-facelift model), the only direct rival to the Kuga ST-Line is the Volkswagen Tiguan Highline AWD R Line. With base prices starting at exactly R50 000 more than the Kuga, it is the more expensive option, but that will likely be offset by better resale values. The Kuga has ample spec and safety features onboard, making it relatively good value for money. In terms of practicality, the Tiguan offers about 10% more luggage space, but roughly the same cabin space with the rear bench folded flat, so space for occupants should be about the same. In terms of sensible considerations such as warranties and service plans, the Ford carries a longer warranty, at 4 years/120 000 km versus 3 years/120 000 km for the VW. Service plans are similar at 6 years/90 000 km versus 5 years/120 000 km. The cars are very evenly matched indeed and it’s definitely worth comparing them spec-for-spec if you are interested in this niche. Has the well-publicised Kuga saga left a scar so deep in the South African motoring conscience that it will take a generation for consumers to forget that some (now discontinued) older Kuga derivatives caught fire? Sales of the Kuga are now roughly a 10th of the figures compared with before the fire controversy, and the reality is that even if the Kuga was the best family car on the market, its sales numbers might still not nudge upwards. The author presents a segment about motoring on talk radio and the Kuga saga was all the station wanted to talk about for weeks. It was front-page news... and still grabs headlines. But the opportunity to rebuild the Kuga brand is there, and the car itself is a solid foundation on which to build. The Ford Kuga 2.0T AWD ST Line retails for R548 500, which includes a 4-year/120 000 km warranty and a 6-year/90 000 km service plan. The Kuga has a serious image problem, but in isolation, this model is a good product. The Kuga 2.0T AWD ST Line impressed in almost every aspect you’d care about in a family car. 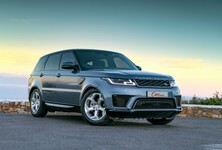 It shows its age in some facets, such as the still somewhat fiddly ergonomics and, to a degree, cabin plastics, but there is no doubt that, as a package, it looks and feels purposeful and its on-road refinement is better than we expected it would be. The performance was plentiful, even if fuel consumption was middling. 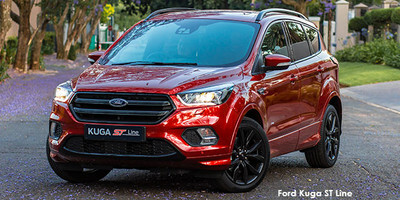 Although we doubt whether the top-end of the family car market, where this particular derivative competes, is that popular with buyers, this car represents the facelifted Kuga dressed in its finest... um, finery. One of our testers' partners said she found the ST Line test unit particularly impressive, declaring that she’d happily own one and drive it every day. 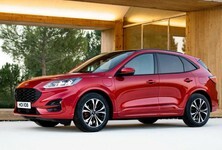 Other consumers, however, will hear the name Kuga and lose interest immediately. Until the Kuga's reputation is restored (if it could ever return to where it once was), the model will continue to divide opinions... despite this product's best efforts.